Embryo fetal development (or the embryonic stage of fetal development), starts at conception and ends by the end of the eighth week. In some cases, women don't even realize that they are pregnant before the embryo becomes a fetus. However, if you are tracking your fertility, then chances are good that you will know you already conceived and you'll want to track your embryo's fetal development. Tracking your embryo week by week can be helpful to see what is normal. It can also be interesting as most moms are just plain excited about the new life forming within them. Here is a list of what to expect along with what your embryo looks like at each week. Make sure your prescriptions are compatible with getting pregnant. Be careful about over-the-counter drugs. Not all of them are compatible with pregnancy and they can affect the embryo. Fetal development is fragile in the earliest stages. Make sure that your diet is healthy and, if you're trying to get pregnant, a good pre-natal vitamin is a definite must. You need that extra folic acid early in pregnancy. The embryo looks like a pear. The neural plate is forming. Blood cells have already developed. By the end of the third week, the embryo still looks like a group of cells. It is wider at the top where the head is and smaller at the bottom with a small narrowing in the middle. Cells have begun to differentiate. The chorion/sac also is beginning to have its own blood supply through forming blood vessels. The heart tube begins to take an "s" shape. When it is finished forming, cardiac contractions will begin (this means that it is possible to see and hear the heart beat on a high tech sonogram). The umbilical cord will be formed and fused to the placenta. The neural system is forming and is the most developed--dictating how the young embryo will look. The beginning cells of the liver form. Not every woman experiences every symptom to the same degree. Don't panic if you're not having symptoms like your friend did--just enjoy this special time of getting ready for your new little one. Have a developing respiratory tract with both left and right lungs. Have an esophagus formed--although it is still developing. At this point, if morning sickness hasn't already kicked in, it is likely to do so now. Your baby's head is still larger than its trunk and distinctive shoulders, upper arm, forearm and finger buds begin to develop. The leg limbs start to elongate and round out. The face is also beginning to develop with nasal pits and distinctive regions of the brain. The embryo is beginning to really develop now! The heart is separating into four chambers, the pituitary gland is beginning to form, the embryo has the beginnings of intestines, the stomach begins to separate from the chest cavity and, in general, things are differentiating themselves. 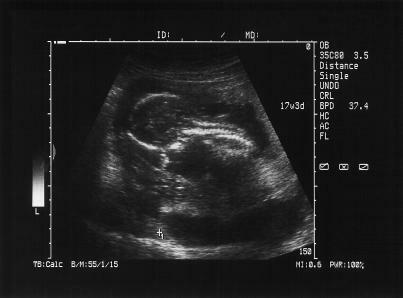 Miraculously, this little c-shaped glob of cells is well on the way to becoming a fully developed baby. After this week, the embryonic stage will end. By the end of this week the brain will be connected to enough tissue that the embryo will begin to make spontaneous movements. Don't think that you've felt him wiggle yet though. . .most first time moms will not feel the baby move until well into the second trimester. Even moms who have been pregnant before won't generally feel the baby move until at least sixteen weeks. Your embryo's eyes are well developed at this point, but are not located on the face just yet. At the end of the embryonic stage, the fingers and toes will be distinctive from the rest of the limbs. Although early pregnancy can often be marred with illness, this is a wonderful time. Enjoy pregnancy because life will never be the same after your baby comes!